Circle L’s Recipe of the Week! This week at the Circle L has been BuSy! We have basketball practice, meetings and more activities. We have been coming home late; it is nice to have easy recipes like this so that I can put supper on the table quickly. This is one of my favorites and our kids love it also. 1) Always wash your hands before and after handling raw meat. 2) Never thaw meat on the counter, thaw in the refrigerator, microwave or cool water bath. 3) Always wash cutting boards and plates after having been in contact with raw meat. 4) Always cook to appropriate internal temperatures. Safe internal temperatures vary based on cut. Hamburger must reach a safe and savory 160 degrees, while steak is safe at 140 degrees. This salad is perfect to take to summer picnics and is so simple. I serve with olives, hot sauce and our kids like a little ranch dressing on their salad. Brown ground beef. Drain fat. Toss with dry taco seasoning. (Please note: this recipe does not call for water.) Set aside until cool. In a large bowl add lettuce, tomatoes, and cheese. Then right before you serve it add the beef, tortilla chips and mix. 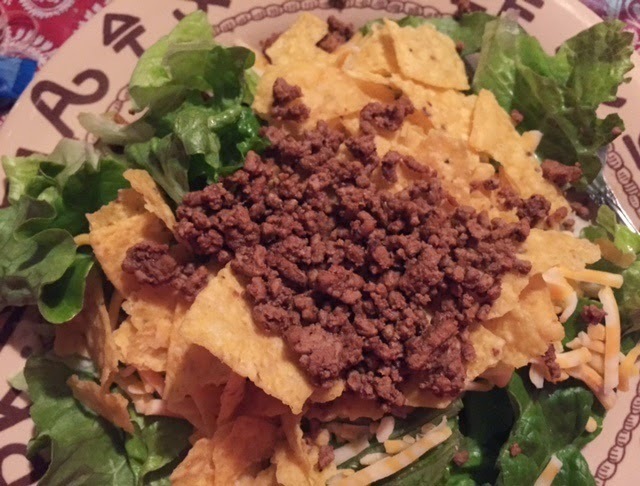 I hope you enjoy Circle L’s Taco Salad.